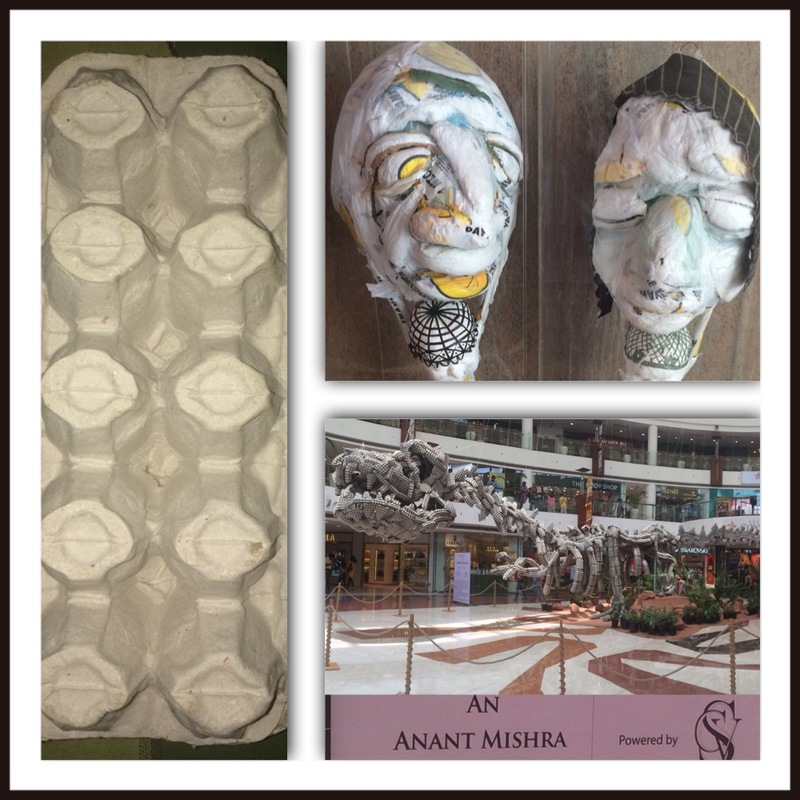 A life-size dinosaur made entirely of I don’t know how many thousands of egg trays by an artist in collaboration with an event management company (see collage; bottom right) caught my attention at a popular mall recently. I was immediately under its spell. It reminded me of the Jurassic Park movies. However, instead of just taking a panoramic shot of it (third time successful) I decided to also read a bit about this artwork which was mentioned on a small pink board placed nearby. It talked about recycling and how we should pledge to recycle, reuse and reduce (I can never remember the last R). Something was not right here. The message and the artwork were not in harmony with each other. How could this enormous, awestruck artwork be an example of recycling? I can’t see how I can re-use, reduce or recycle an egg tray or even a carton in my day-to-day life! These wastes are merely good for art and craft activity. I do remember my daughter making a caterpillar of one of the egg trays for a school activity when she was five or six (which must be gathering dust somewhere in the store-room along with her other such activities in the name of recycling). I am not undermining the achievement of the artist. It is certainly a feat but not in the context of recycling. It is purely art for art’s sake. Recycling (as opposed to reusing and reducing which are still practical and I think one and the same) at home is nearly impossible unless you have a scientific bent of mind and you can change the ‘parent’ waste to some other useful form. In the UK (since I have lived there and I know) every house is given more than one big bin to throw their wastes in – one for general waste, one for recycling, and one for the cut grass and other greens which then gets weekly collected by the council (municipality) who then perhaps have a system of handing it over to recycling industries. The council is very particular with its definition of a recycle waste and how the recycle waste shouldn’t be just thrown into the recycle bin after solving its purpose to the mankind. For instance, the used bottles and cans needs washing, caps need to be separated from the bottles, etc. 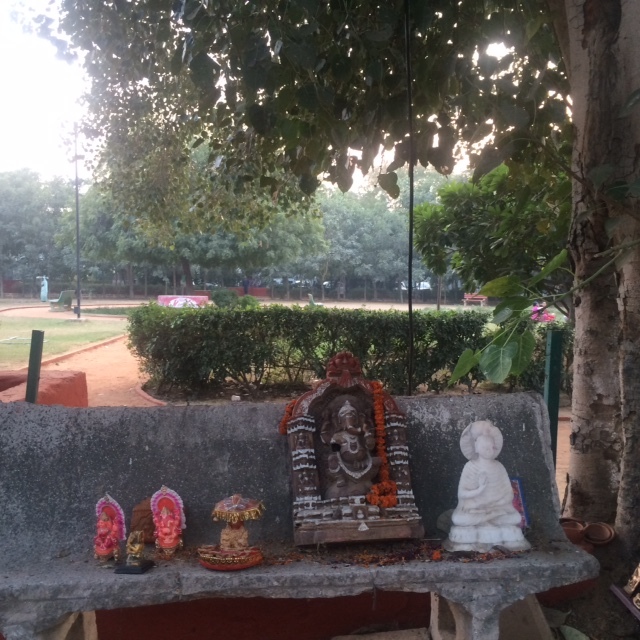 We have a somewhat close arrangement here in India, albeit private, with our ‘kabaadiwaala’ (junk collector man) who appears in our area announcing his presence aloud in a strange not-to-be-missed tone. He comes on his cycle attached to a cart. However, you really need to expend not just your precious time but also your energy as haggling with the kabaadiwaala requires these both in abundance along with the art of haggling (which is just not my cup of tea!). And he is more interested in collecting your junk (as his work title suggests) than your egg trays and cartons. He is happy with newspapers, books and bottles though. Art is art and I believe, it should be left as it is-for the eyes of the spectators to soak in the awe and splendour. A better idea would be that concerned NGOs, government ministries, estate developers (who charge good amount of tax) start a collection service of recycle wastes instead. Now that would be a practical initiative. The picture on the collage’s topmost corner right is of another artwork made of waste paper (I presume) seen in the same mall on the same day but at a different spot. I found it equally interesting but could see no information on it.